BRUNCH is from 11:30 a.m. – 2:00 p.m.
Brunch is offered on Saturday & Sunday at the Blomidon Inn. It’s a “local” affair! The smoked salmon, the eggs, the whipped cream are always Nova Scotian. The coffee is “Fair Trade” and it’s brewed just outside of town. As the spring, summer, and autumn unfold most of what you see in the above photo is from Nova Scotia’s fertile Valley or bountiful seas. Come, have Brunch at the Blomidon Inn soon. 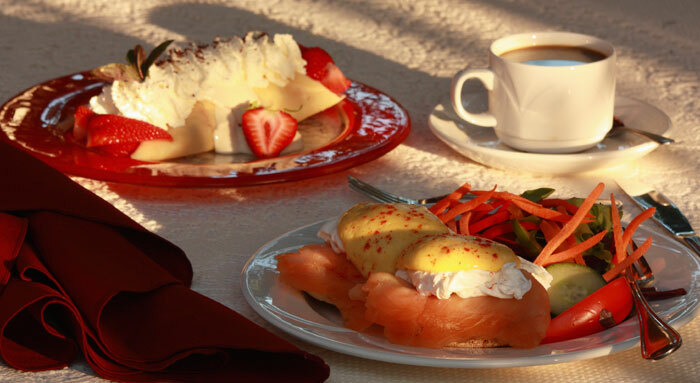 Order the Eggs Benedict with smoked salmon; a fresh Strawberry Crepe and a “Just Us” coffee. It will taste as good as it looks in the photo!